The caption in four languages can't be mistaken: those boots are Celestino's, A.K.A. Celestino Colombo from Parabiago, Milan. The very same boots are kept at the Nederlands's Dutch & Leather Shoe Museum (D&LSM). La didascalia in quattro lingue non lascia dubbi: questi stivali sono di Celestino's, alias Celestino Colombo (Parabiago, Milano). Stivali oggi conservati al Dutch Leather & Shoe Museum di Waalwijk, Olanda (DL&SM). We first published the picture here below when we crossed path with Inge Specht-den Boer, D&LSM curator and PR (2013): she was organizing the archive in order to make their footwear collection available online. 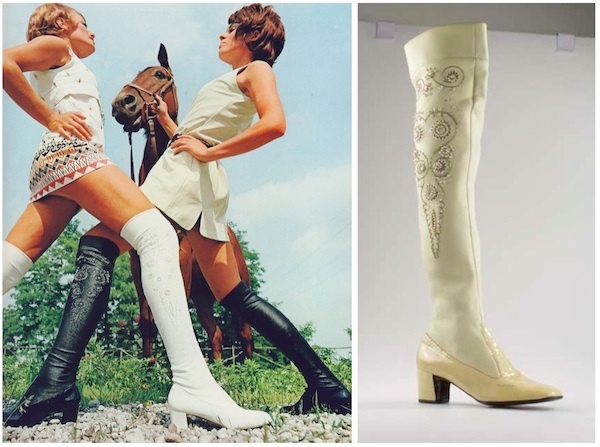 We provided information and vintage advertisements and she matched them with the actual Celestino's boots. La foto qui sotto l'abbiamo pubblicata la prima volta nel 2013 in seguito allo scambio di informazioni con Inge Specht-den Boer, curatrice e PR del DL&SM. Stava lavorando all'archivio delle calzature in previsione della messa online del medesimo. Noi abbiamo fornito informazioni e foto, mentre lei ha trovato i corrispondenti stivali di Celestino's. Part of the feature "Fashion In Parabiago"
So, why are we saying it again? Wasn't it all clear the first time around? It was, but not for a Milanese brand (MB, from now on) who decided to use the picture above, plus a D&LSM picture, and advertise them as their own! Both photographs were used for a campaign called "We Want You And Your Shoes", an invitation to their customers to bring over everything they might have in order to rebuild their own archive. The campaign was described as a "social call for action" in order to establish the "first example of a shared archive". 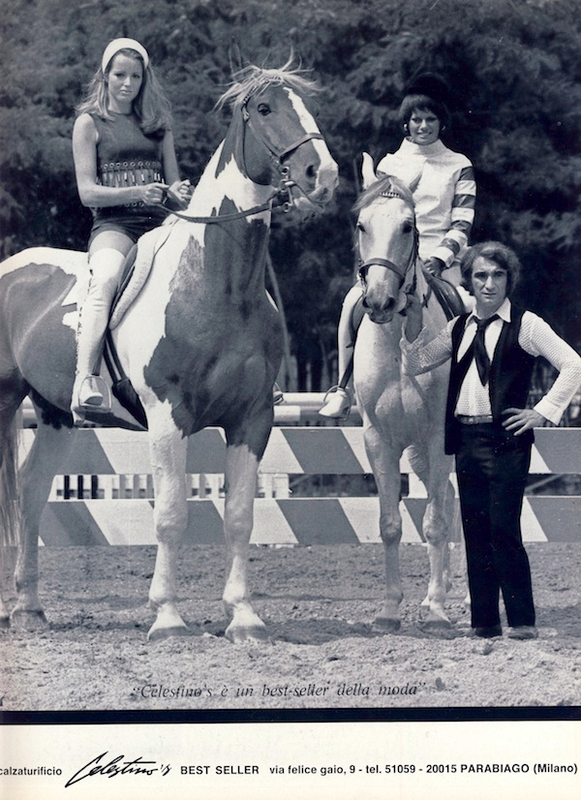 Now, the Celestino's photograph was taken from our website - we know this for a fact - without asking and without credits. It wasn't the first time. It was used on both their facebook and Instagram accounts and later for the campaign. Even worse, they did the same with the D&LSM photograph. 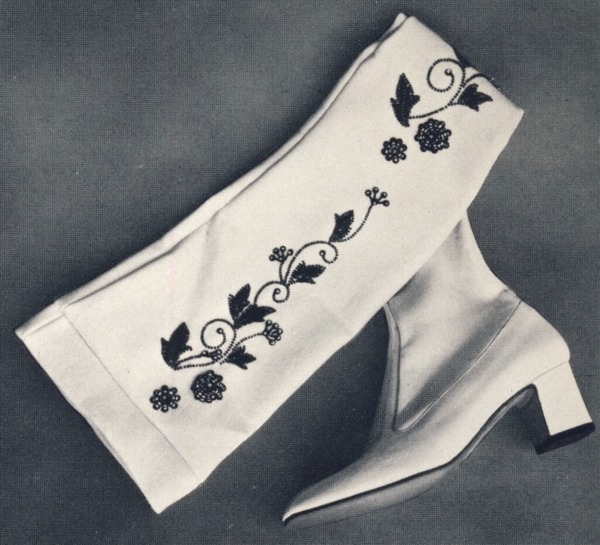 The museum sent MB photographs of the Celestino's boots for the only purpose of a book evaluation. The museum didn't authorized any other use, let alone a campaign of any kind. E quindi perché lo stiamo ripetendo? Non era sufficientemente chiaro? Sì, lo era, ma un marchio milanese (MM da qui in poi) ha deciso di utilizzare la foto in questione - e anche una foto del D&LSM - spacciandole come proprie. 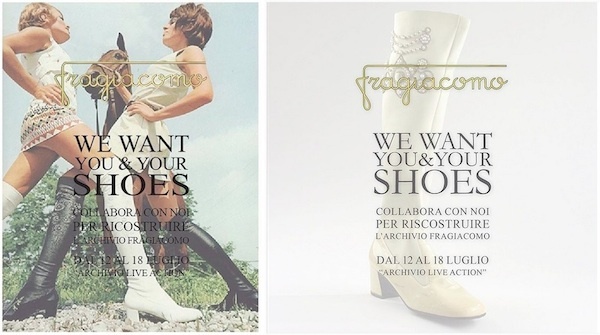 Entrambe le foto sono state utilizzate per una campagna promozionale chiamata "We Want You And Your Shoes", un invito ai loro clienti a fornire qualsiasi oggetto inerente il marchio stesso, per poter ricostruire il loro archivio storico. In italiano contemporaneo l'hanno chiamata "social call for action", meglio definita come "primo esempio di archivio diffuso". Abbiamo la certezza che la foto di Celestino's é stata presa dal nostro sito, senza chiedere e senza citare la fonte. Non è la prima volta. È stata utilizzata prima nelle pagine facebook e Instagram di MM e successivamente per la campagna di cui sopra. Peggio hanno fatto con la foto del D&LSM. Il museo ha inviato ad MM alcune foto dei loro stivali Celestino's per il possibile utilizzo in un libro. Nessun altro uso é stato autorizzato, tantomeno per una campagna promozionale. 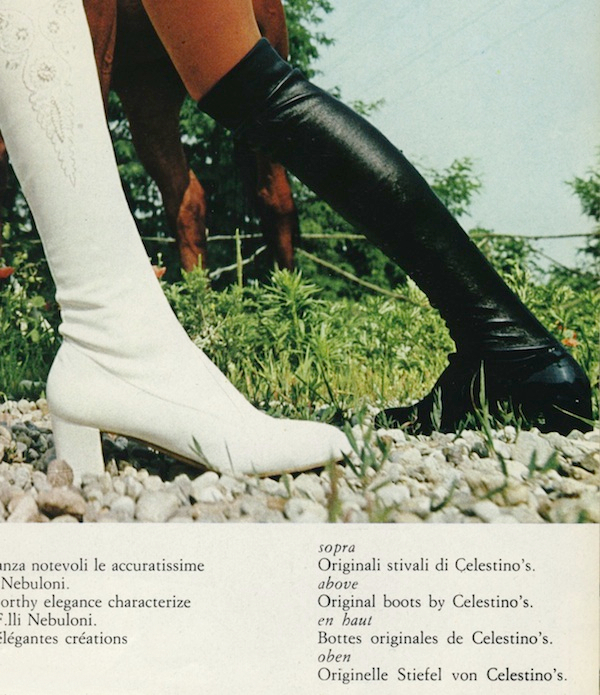 Celestino Colombo licensed a boot to MB back in 1969, possibly even manufactured it. We published a low-res photograph of it in 2011 (now removed for good) and of course MB lifted it for their own website with the same M.O. (no asking/no credits). It's fair to say the original boot and the one licensed were very, very similar, so they use it. Brilliant. At least they made us smile when they clumsily chose the wrong D&LSM photograph. The right one is shown here below. Basically, in addition to all the above, they managed to be wrong twice. Celestino Colombo ha venduto la licenza di un suo stivale a MM nel 1969, probabilmente lo ha anche prodotto. Una foto in bassa risoluzione l'abbiamo pubblicata nel 2011 (ora rimossa) e ovviamente MM l'ha utilizzata per il proprio sito (identica procedura: niente richiesta e niente fonte). È giusto ricordare che lo stivale originale e quello licenziato a MM erano molto, molto simili e quindi lo hanno utilizzato. Brillanti. Perlomeno ci hanno fatto sorridere quando hanno maldestramente scelto l'immagine sbagliata del D&LSM; quella corretta la mostriamo qui sotto. In pratica, oltre a quanto scritto, sono riusciti a sbagliare due volte. As seen in Vogue, wrote MB on their Instagram page. While Glamorous, it wasn't. To make a long story short, their idea of the "first example of a shared archive" means: we need your stuff (because we don't have a thing) and you better hand it over otherwise we'll take it anyway. In doing so, they managed to disrespect a museum, spat on our work (more than once), and cheating on their customers projecting a phony image of themselves. As far as we are concerned, we are now MB-free: every single piece of information about them has been removed from TheHistorialist and we feel content about it. It is not far fetched to believe that the Dutch & Leather Shoe Museum thinks otherwise and - rightfully so - proceed differently. In sintesi, il concetto di "primo esempio di archivio diffuso" significa: ci serve la vostra roba perché noi non abbiamo conservato nulla e quindi consegnatecela altrimenti ce la prendiamo comunque. Così facendo sono riusciti a mancare di rispetto ad un museo, sputare sulle nostre ricerche (più di una volta), per non dire della falsa immagine di se stessi comunicata ai propri clienti. Per quanto ci riguarda abbiamo rimosso ogni singolo riferimento a MM da TheHistorialist e ci consideriamo soddisfatti. Non é escluso che il Dutch & Leader Shoe Museum la pensi diversamente e - come giusto - proceda in altra direzione. A team of experts and young researchers from the University of Rome "La Sapienza", will collect the (customers') materials and issue a receipt for the temporary hand over. The customer will be involved in a series of activities to enhance its contribution (interviews, photographs and clips). A gadget will be offered for their important role .. Eventually, the customers will be contacted for a possible purchase of their shoes or images, and also to check their willingness to lend their treasures for exhibitions and events. Fine then: we will not fail to deliver to the young researchers of "La Sapienza" all the information to properly file our treasures. Hey, we want our gadget too! I prestatori verranno quindi ricontattati per l’eventuale acquisto delle calzature o delle immagini, ma anche per verificare la loro disponibilità a prestare i loro tesori in occasione di mostre ed eventi. Bene: a questo punto non mancheremo di consegnare ai giovani ricercatori de "La Sapienza" tutte le informazioni per catalogare correttamente i nostri tesori. Anche noi vogliamo il souvenier! For what it's worth: it's written on the bottom of every single page of this website: "You are free to quote and share our contents and photos, as long as you inform us and link back to TheHistorialist. Permission not granted for commercial purposes." Per quanto possa valere: in fondo ad ogni pagina di questo sito si legge: "siete liberi di citare e condividere testi e foto previa richiesta e inserimento del link TheHistorialist. Negato l'utilizzo per scopi commerciali."